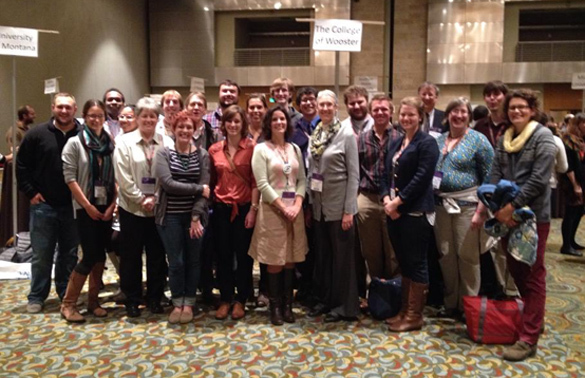 DENVER, COLORADO–It is a tradition at the annual GSA meeting to have a Wooster Geologists alumni gathering. Here is this evening’s happy crew of current students, faculty and alumni — or at least a snapshot of a continuum of people coming and going. We missed Dr. Greg Wiles, who could not be with us this year. Thirty people were present at some point. 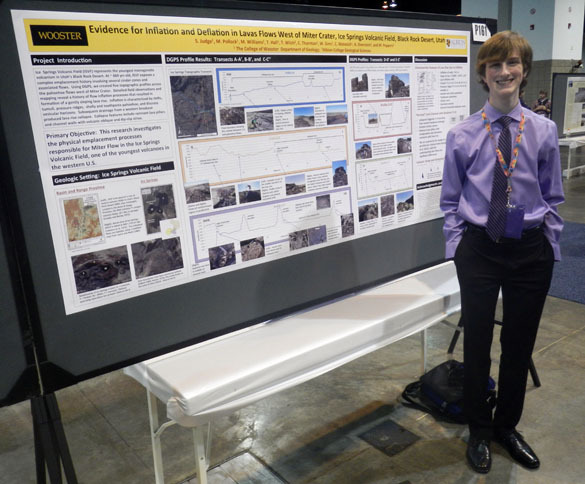 DENVER, COLORADO–Michael Williams (who chose a particularly impressive shirt and tie today) and Dr. Shelley Judge presented a poster at the Geological Society of America meeting entitled: “Evidence for inflation and deflation in lavas flows west of Miter Crater, Ice Springs Volcanic Field, Black Rock Desert, Utah.” This was the first offering from this year’s Team Utah. Michael proved to be an effective and animated communicator — and possibly the only sophomore presenting at the meeting! 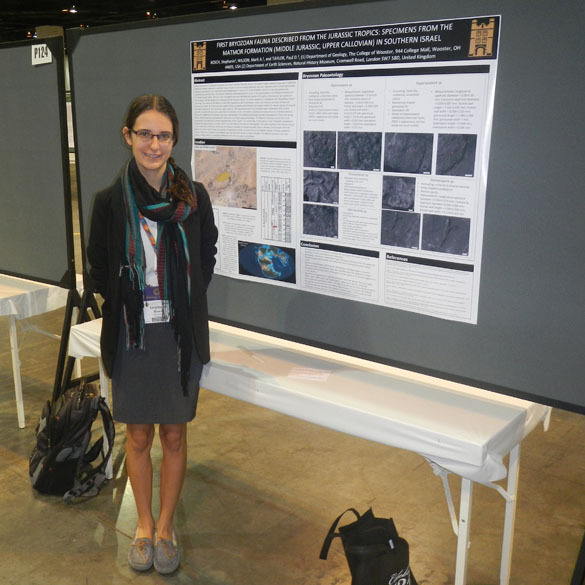 DENVER, COLORADO–This afternoon Dr. Meagen Pollock presented a poster at the Geological Society of America entitled: “The history, current best practices, and future trajectory of the Independent Study (I.S.) program at The College of Wooster“. In this work, co-authored with the other Wooster geology faculty members, Dr. Pollock outlined the structure of I.S. in geology, emphasizing the philosophy behind what we do. It was well attended, from what I saw, and started many interesting conversations about undergraduate research. An advantage of presenting this poster here is that there were several Wooster I.S. students nearby showing their research results. DENVER, COLORADO–Yesterday Oscar Mmari (’14) gave the first presentation from Wooster’s Team Israel 2013 at the annual meeting of the Geological Society of America in Denver. Today our two paleontologists on the team discussed their posters. 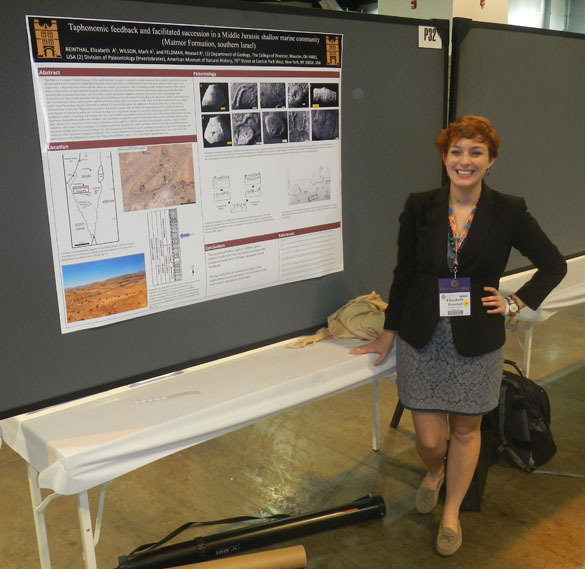 Above is Lizzie Reinthal (’14) cheerfully giving her poster entitled: “Taphonomic feedback and facilitated succession in a Middle Jurassic shallow marine crinoid community (Matmor Formation, southern Israel)“. Her work is co-authored with our friend Howie Feldman. Below Steph Bosch (’14) is ready to discuss her work: “First bryozoan fauna described from the Jurassic tropics: Specimens from the Matmor Formation (Middle Jurassic, Upper Callovian) in southern Israel“. 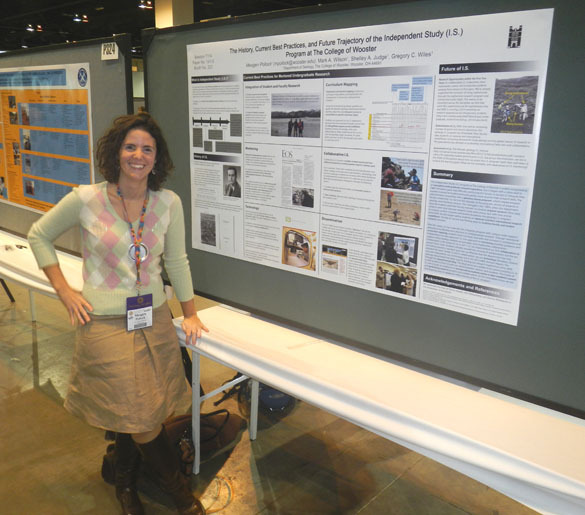 Steph’s poster has the famous palaeontologist Paul Taylor as a co-author. It is great fun to see these students make the transition, both intellectually and physically, from the scorched desert floor of the Negev to such a professional setting. The faculty are very proud.